Leverage G-force concepts from the Interplanetary Volume to modify current concept of space elevator. Table-2: Thirteen Challenges. Of the many difficult problems with the cable design, this table reviews 13 factors blocking implementation of the space elevator. Table-3: Challenge Responses. This table shows how the TE solution greatly mitigates the challenges listed in Table-2. Habitat at 1G provides very comfortable living quarters for over 1,000 climber passengers. Like other habitats throughout the inner Solar System, it would simulate Earth gravity via spin induced centrifugal force and obtain power from solar light reflected via attached mirrors. APEX ANCHOR: ("counterweight") keeps tether taut, but it's much more than just mass. CHALLENGE-1: Many requirements include thrust and reel in/out capabilities. 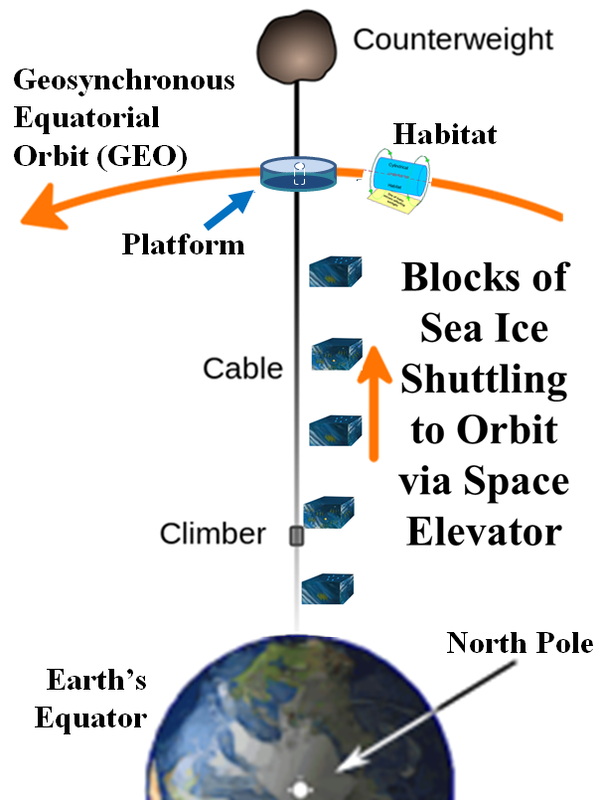 GEO PLATFORM processes climbers as they transit. C-2: Complex symbiotic relationship between GEO structures and Space Elevator. TETHER must go from Earth's surface to GEO (35,800 km); thence to AA (100,000 km). C-3: DEVELOP CABLE MATERIAL a impractical tech requirement. Even for future materials, associated "strain" might break the tether anytime. CURRENT CLIMBER CONCEPT: Assume climb velocity of 220 kph. C-4: Climbers need considerable energy for 7 day ascent to GEO Node. C-5: DEADLY RADIATION from Earth's Van Allen belts is a horrible health hazard. C-6: LIFE SUPPORT ESSENTIALS: (O2 , H20, food); simulated gravity, communication. C-7: LIFEBOAT CONCEPT: If failure occurs, climber must safely glide back to Earth. BASE STATION secures the Earth bound end of the cable to Equator. C-8: Deploy sea based mobile base stations to readily avoid hazards such as: high winds, storms, and space debris. TETHER CONSTRUCTION is a highly complex project, extending decades and costing $Billions. C-9: INITIAL DEPLOYMENT: Place entire cable on a large spool into geostationary orbit above the planned anchor point. CONTINUED OPERATIONS: To remain "parked" on GEO, carefully balance cables . C-10: When a cable deploys mass "downward" (toward Earth), it must be immediately balanced by an equal mass going "upward" (away from Earth). C-11: TERRAFORMING missions will require numerous loads of sea ice and top soil needed by habitats. MOST LIKELY COLLISIONS involve objects too small and too numerous to avoid. These include tiny meteorites as well as man made debris in orbit. C-12: SWEEPER TETHER must absorb numerous impacts of space debris. C-13: HORDES OF NANOBOTS, tiny AI devices, must collectively act either autonomously or remotely to rapidly repair ribbon rips. OFF EQUATION: Does Tether's Anchor need to be on Earth's Equator? . C-14: If MARINE ANCHOR locates south/north of Equator, tether points down/up to lose certain GEO benefits..
14 reasons to implement g-force elevators; 14 technologies to help. CHALLENGE-1: Apex Anchor (AA) provides mass for it's "counterweight" function, but it also needs thrust and reel in/out capabilities. 1) SE solution is currently designing for these added features. ISEC freely admits that "modeling specifics" will improve as we learn more. 2) Even better, Thought Experiment (TE) Solution (see previous chapter) can eliminate this risk, because it uses Earth bound, particle accelerator to generate particle beam to propel g-force elevators to GEO. Thus, SE vehicle (i.e., “climber”) would no longer climb, and there is no longer a need for physical cable from Earth. Since particle beam would delete need for cable; there is no need for cable tension and no need for Apex Ancho whose only function was to "stretch" the cable to create tension. Electromagnetic fields propel ions (atomic nuclei, from atoms which gain a positive charge when stripped of electrons) to high speeds as well-defined beams. Inside high-energy accelerators, the particle speed can ever increase until almost (but not quite) c, light speed in a vacuum. Thus, they can contribute considerable collective momentum to a g-force elevator. is a magnetic confinement device, a highly researched candidate for controlling thermonuclear fusion power. It uses magnetic fields to confine ions (i.e., plasma, stuff of stars) because no solid material can withstand plasma's extremely high temperatures. Tokamak is a torus (i.e. "doughnut shaped") device with specific dynamic, magnetic field lines in a helical shape. 2) Poloidal field (travels in circles orthogonal to the toroidal field) from a second set of electromagnets inside the torus. CHALLENGE-2: GEO Node and the SE vehicles use each other. (Once operational, GEO node holds up the cable for climbers to climb with payloads for GEO node. However, initial implementation is a “chicken or egg” paradox. EXAMPLE: Initial cable is not there for initial climbers to climb; so, how does cable first get there? How does GEO construction happen??? 1) Traditional SE solution uses a complex Project Management Solution to initially implement initial SE system. To launch initial cable and GEO materials, it uses the same rockets that SE wants to avoid using, (another paradox!!!). 2) Even better. TE solution avoids this paradox if g-force elevators use a fusion engine like a tokamak. SE vehicles could use a large magnetic dish to collect particle beam ions and ingest them into the vehicle's tokamak engine. TE assumes tokamak engine could expel a portion of the collected ions as high speed particles to further contribute to a significant momentum exchange to propel vehicle. 1G propulsion is desired; however, a lesser acceleration would still get the vehicle from Earth to GEO in a fairly short time. TE further assumes that initial vehicles could autonomously decelerate to "park" at GEO orbit directly above Base Station. 1) Traditional SE proposes that every daily climber inspect entire Uplink length and repair as required. 2) Even better. TE proposes to leverage recent advances in particle acceleration. These indicate particle beam propulsion of g-force elevators is much more practical than climbers traversing 38,000 km of nanotube cable. Recent advances indicate future accelerators will use plasma waves of very high charge separations to propagate through the pipeline much like current RF waves. Thus, future accelerator will "phase-lock" a particle bunch on a plasma wave to gain higher velocities. Plasma wakes come from laser pulses or electron bunches with accompanying electrostatic fields. generates fusion power. It uses magnetic fields to confine hot fusion fuel as a plasma. Fusion reactions combine light atomic nuclei such as hydrogen (1H) to form heavier ones such as helium (4He). 1) SE Solution: During 7 day trip, seamlessly satisfy power needs with solar panels and store only enough energy to hibernate during inevitable “night times” when climber must briefly endure Earth’s shadow. 2) Even better. Reduce trip time to hours via high speed ion acceleration. During this brief flight, a more feasible energy source might be the vehicle's tokamak engine. Tokamak could ingest high speed particles from Base Station synchrotron to further increase energy levels inside tokamak plasma stream. Some of these particles could eventually exit tokamak and SE vehicle in a controlled fashion to contribute to vessel's forward momentum. 1) SE recommends all tethers restrict locations to the small portion of equator least likely to be under radiation belts. 2) Even better, a beam driven vehicle can make the same trip in 300 minutes (assume .1G acceleration/deceleration). • Lot less time for REMs to do their dirty work. • Less need for heavy shielding to protect passengers. • More capacity for payload, the purpose for the trip. • Many more equatorial locations available. ---The e-bunch typically ionizes the gas to create both the plasma and the wake. ---The e-bunch's field pushes plasma electrons out of center to create the wake. Researchers boosted e-bunches to energies up to 500 times higher than a traditional accelerator. SLAC accelerator physicist Mike Litos: "... accelerate an electron beam to the same energies achieved in the 2-mile-long SLAC linear accelerator in less than 20 feet." This will lead to smaller, cheaper accelerators. Electron bunches increase beam capacity of particle accelerators parked at Earth's Base Station and GEO's platform. 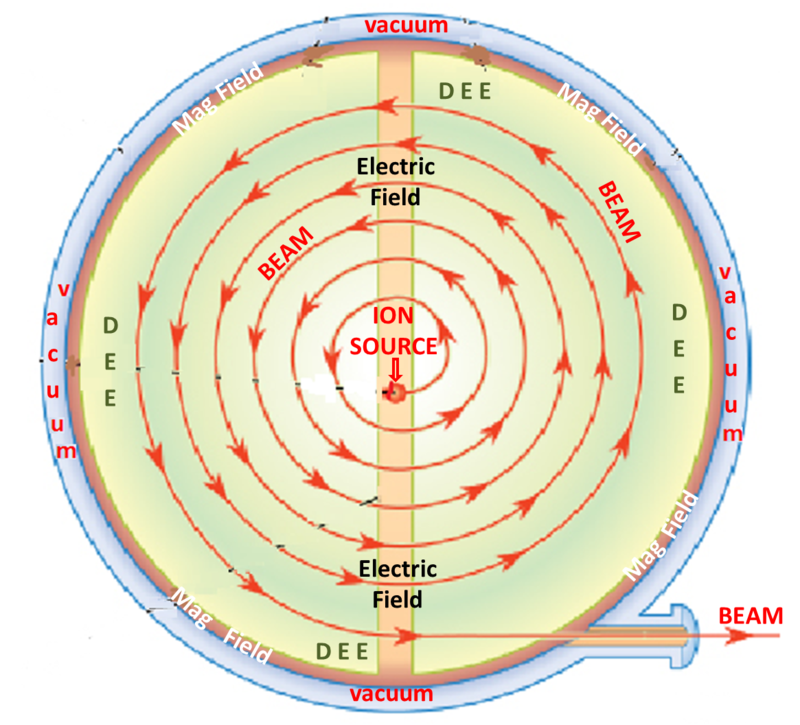 ---The associated electric field separates the electrons and nucleons. ---The electrons leave the center of the wake to form a positive bubble, the "blowout regime". ---On a larger scale, a "bubble" of charge seems to move through the plasma at nearly light speed. CHALLENGE-6: Life sustainment requirements. 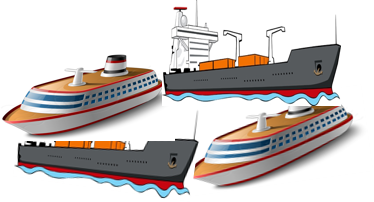 For 7 days, passengers require considerable consumables: O2, H2O, food, and entertainment; this requirement decreases payload and increases risk. 1) SE Solution: If International Space Station can store sufficient supplies for many months, it’s very likely that climber can provide for 7 days. SIDE ISSUE: Weightless for a week due to slow, constant velocity climber (220 kph) far from Earth. It could be great fun for some; on the other hand, it could cause sickness in others. 2) Even better, a Beam Rider can make trip in 100 min to greatly reduce need for consumables. Storing oxygen, water and food for a one hour flight becomes trivial. The only reason water and food are needed at all is for emergency rations if the vehicle has to assume lifeboat mode. Climber must be able to detach from tether at anytime and assume lifeboat role. (further described in LIFEBOAT chapter). a) More stringent life support requirements come into play. b) Parachute deployment must wait till capsule reaches atmosphere. c) Rapidly descending climber capsule must take special precautions to not burn up due to atmosphere reentry. 2) Much, much better, TE's Beam Rider vehicle has much less need for a lifeboat. For one thing, 64 minute flight has lot less risk than a 7 day voyage. NOTE: A g-force flight profile doesn't have much leeway for abort options. LIKELY SCENARIO: If the vessel's crew decides to abort at midway point, it still must follow original flight profile to decelerate to zero velocity. Recall the vessel constantly accelerates at 1 G to reach halfway point (about 18,400 km above Earth surface), to achieve velocity of 18 km/sec (about 40,000 mph), an enormous speed. From midway, it must then reverse propulsion vector to decelerate at 1G and arrive at GEO platform at essential zero velocity. MAJOR PROBLEM: Plasma often "spills" out of the confinement area due to plasma's natural turbulence. When turbulent plasma touches the container walls, "sputtering" will result, and high-mass particles from the container (often steel and other metals) mix with the plasma to lower its temperature. Turbulence has been long considered an unavoidable feature of plasmas; however, scientists can now more fully control plasma turbulence to greatly reduce energy leakage. Tokamak and Stellarator both use electromagnetic waves to manipulate the paths of plasma particles for large electrical currents for the magnetic confinement fields. Common confinement factor seems to be a dynamic spiraling magnetic field. A series of large magnetic mirror devices were built and tested from the late 60's to the mid 80's. The magnetic mirror traps high temperature plasma using magnetic fields. A magnetic mirror designer configures electromagnets for an area of very dense magnetic field lines at either end of the confinement area. At either end, departing particles experience an increasing force to reverse their direction; then, return to the confinement area. However, this reversal happens only within a limited range of velocities and approach angles. Magnetic mirrors now play an important role in other types of magnetic fusion energy devices such as tokamaks. CHALLENGE-8: Deploy mobile, sea based “anchor” station to secure tether to Earth at the Equator and move as needed. 1) SE Solution: CABLE BASED anchor station could use retired vessels to secure cable and move entire tether as required to avoid weather and debris. 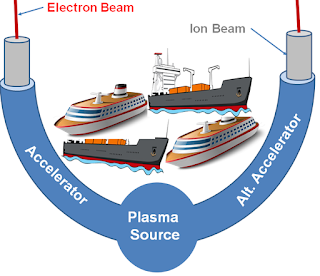 2) Even better, BEAM BASED TE Solution: On Earth’s Equator, base station includes a sea based particle accelerator for the high speed particle beam. Thus, no need to move tether; just delay beam until conditions are good. CHALLENGE-9: Tether construction. is an incredibly complex project. 1) SE Solution requires successive completion of following challenges:. a) Use rockets to lift a minimum size initial "seed cable" of only 19,800 kg. b) Seed ribbon should support a climber of 619 kg. c) First 200 climber trips would carry more cable material to increase seed cable's cross section area to about 160 mm at its widest point. d) Finished cable is 750-tons with a lift capacity of 20 tons per climber. 2) Even better, TE’s beam driven; g-force elevator requires no tether; thus, requires none of above. a) There is no need for "seed cable", because “no tether” needs no cable. b) There are no initial climbers, because TE elevator doesn't climb; initial beam propelled vehicles fly to GEO to build initial GEO Node. c) Initial vehicles will transport platform components to the GEO as well as human specialists to assemble them. d) Operational beam propelled vehicles will carry whatever the missions require; their lift capacity is not yet determined. During reactor startup, the plasma must heat to its operating temperature exceeding 108 deg C. Since current tokamaks do not yet produce enough fusion energy to maintain this plasma temperature; this is an ongoing challenge. 1) Ohmic Heating Ohmic (i.e., resistive) heating comes from an induced current through the plasma; ohmic is same heating as in an electric toaster. Quantity of generated heat depends on the plasma resistance and the amount of electric current. As the plasma temperature rises, resistance decreases; and ohmic heating becomes less effective. Thus, tokamak's maximum plasma temperature via ohmic heating is 3×107 deg C. For higher temperatures, use following methods. 2) Neutral-Beam Injection High energy atoms enter an ohmically heated, magnetically confined plasma in the tokamak. The extracted, positive ions change their charge when they go through a neutralizer section of the beam line; they gain negative electrons and become neutral molecules. However, they keep the high velocity from the ion source; thus, they interact with the main plasma ions to heat the bulk plasma to fusion-relevant temperatures. 3) Magnetic Compression Just as compressing gas gains heat, compressing plasma (by increasing the confining magnetic field) also heats it. In a tokamak, simply move the plasma radially inward for a higher magnetic field. Since plasma compression brings the ions closer together, the process helps gain required density for a fusion reactor. 4) Radio Frequency Heating﻿﻿﻿﻿﻿ Klystron generates microwaves (MWs) outside the torus. With the correct frequency and polarity, MW energy goes to the charged plasma particles. Resulting collisions among all the plasma particles further increases the bulk plasma temperature. The first circular accelerator was a cyclotron, a simple device consisting mainly of a pair of hollow "Dees", 'D' shaped plates. These function as a single large dipole magnet to bend the particles' path into a spiral. Thus, the particles enter the magnet's center at a very low velocity; then, they exit the outer edge at their maximum speed (approx. 0.1c). Today, cyclotrons often function as the initial acceleration stage of a synchrotron. 1) SE Solution. Maintain GEO Node's Center of Gravity (CG) exactly at GEO. Thus, cable weight from platform to Earth must always exactly equal the cable weight from platform to Apex Anchor, much further "spaceward". This requires continual adjustments as climbers get on/off highly dynamic tether. 2) Even Better! TE proposes a beam driven vehicle with no tether; thus, no need to balance downward cable with upward cable. Thus, it's much easier to keep GEO Node's CG precisely at GEO. CHALLENGE-11: Terraforming requires numerous loads of sea ice and top soil. Typical habitat will require 100s of tons of water for life support and comfort of 1,000s of occupants. Habitats will also need 100s of tons of topsoil for Terran flora to provide O2 and fresh food; not feasible for launched rockets. 1) SE Solution. To reliably shuttle between surface and GEO, current SE plans call for daily climber trips from Marine Anchor to GEO Node. This would take years to supply just one habitat. Increasing climber frequency would greatly increase risk of rips, breaks and other hazards to tether and climbers. 2) Much better, TE solution can do consistent, hourly shuttles from Base Station to GEO Node. At 1G acceleration to midway (17,893 km) and 1G deceleration from midway to GEO platform(17,893 km), a fleet of beam driven vessels could readily make hourly trips between GEO and base station. To maintain the fusion process, hot plasma particles must stay in the central region, or the plasma will rapidly cool and lose their essential energy. 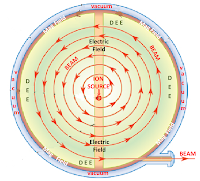 Thus, magnetic field ions must follow helical paths along the field lines. In a simple toroidal field, the magnetic field lines form parallel circles around an axis of symmetry. 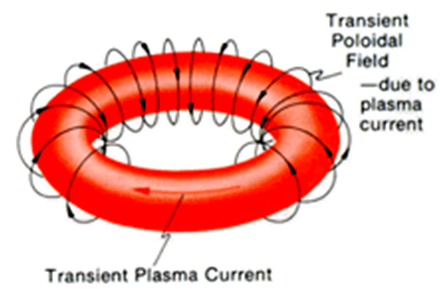 Unfortunately, a strictly toroidal field does not effectively confine a plasma. Consider the orbits of individual particles. 1) they spiral along the helical field lines. 2) they also drift across the field. Very high energy deposits on small areas can cause a "disruption". In an operational tokamak, typical disruption causes slight damage; however, disruption damage could eventually accumulate to become significant. 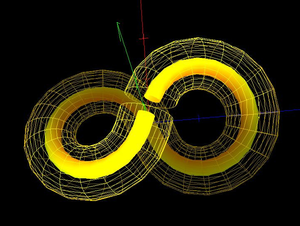 This is a torus, cut in half; then, attached back together with straight "crossover" sections to form a figure-eight. As plasma ions do high speed orbits throughout this device, they drift axially and radially from inside to outside; fortunately, such drifts tend to cancel out.. Newer stellarators use additional magnets to "wind" the field lines into a helix (winding field) to more effectively cancel any drift. 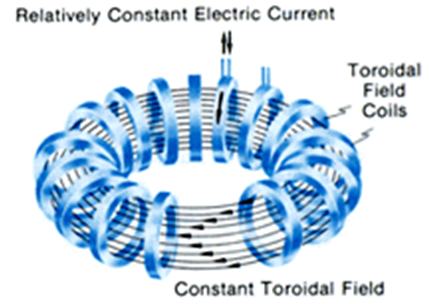 Now, most confinement research is based on the tokamak; a current periodically goes through the plasma to create an electrical field "around" the torus. This field combines with the toroidal field to produce a helix similar to a modern stellarator. CHALLENGE-12: SWEEPER TETHER. Many space objects such as meteoroids, micrometeorites and orbiting man-made debris are too small to detect. Thus, tether must absorb numerous impacts of small debris without breaking. 1) SE Solution proposes numerous nanobots reside in tether to accomplish instant repairs after every impact. Thus, ribbon cable might make good broom to "sweep" away pesky debris in near Earth orbit; however, this doesn't help the climbers climb any better. 2) Even better, TE’s beam driven, g-force elevators don't need to "sweep" anything. During their 300 min trips from Base Station to GEO Node, these vehicles will encounter very little space debris. CHALLENGE-13: DEPLOY NANOBOT HORDES to rapidly repair inevitable rips and tears of cable fabric. 1) SE Solution. Deploy hordes (i.e., millions perhaps billions) of nanobots, tiny AI devices to collectively act either autonomously or remotely to rapidly repair ribbon rips. This new technology is an innovative way to help cable climbers keep on climbing; however, it adds even more overhead to an already cumbersome and unwieldy enterprise. 2) Even better, TE Solution!!! G-force elevators won't need a physical cable; thus, no cable maintenance required. However, they'll likely need a much smaller number of nanobots to do a different set of tasks. During their 300 min trips, these vehicles might use a few thousand nanobots for some routine maintenance in an nonhuman environment. Inevitably, some plasma discharges eventually collide and react with the inner wall of the tokamak's vacuum chamber. These fusion reactions produce large quantities of high energy neutrons (neutron flux). Electrically neutral, these errant neutrons ignore magnetic fields as well as the surrounding vacuum chamber. Neutron flux reduction requires a neutron shield boundary to surround the tokamak. Best suited shield materials have many hydrogen atoms; because H atoms are near the size of neutrons, they work best to absorb the neutron flux. Good candidate materials include water and plastics. Boron atoms are also good absorbers of neutrons. Thus, concrete and polyethylene doped with boron make inexpensive neutron shielding materials. To make electricity from a tokamak-based reactor, use a liquid metal blanket to absorb some neutron flux. Flux’s kinetic energy would use a heat-transfer process to ultimately turn a generator. Plasma weapons can aim and fire a plasma (ions, often called "stuff of stars") stream at desired targets. EXAMPLE: MARAUDER (Magnetically Accelerated Ring to Achieve Ultra-high Directed-Energy and Radiation), a United States Air Force Research Laboratory (AFRL) project, one of several US efforts to develop plasma-based weapons. CHALLENGE-14: EXPAND MARINE ANCHOR CAPABILITY to locate away from Earth's Equator. 1) SE Solution: "Sub-Orbital". Let Marine Anchor (MA) locate at 8.7°S latitude to secure the tether bottom. 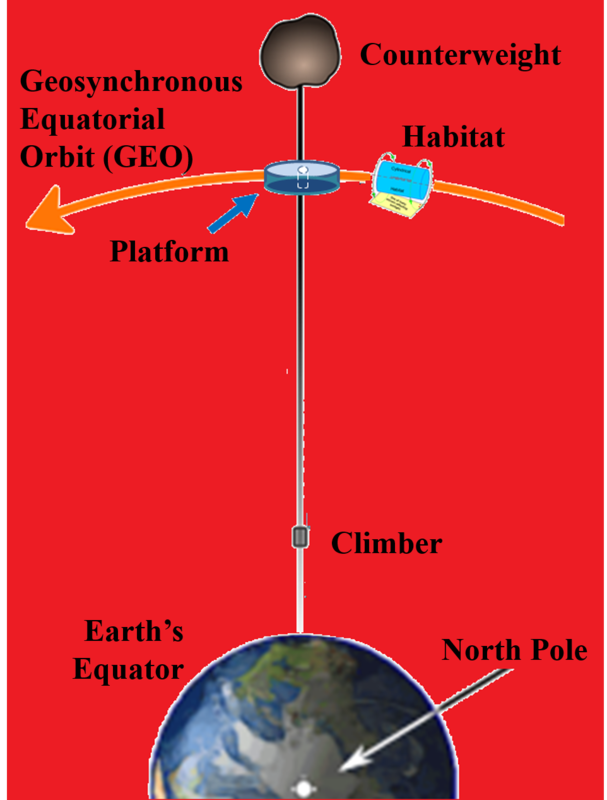 With centrifugal force directed from Earth's center, taut tether's restraint maintains a co-linear relationship among MA, sub-orbital node, and Apex Anchor (AA); so, sub-orbital node rotates around the Earth's axis at 15°/hour to remain geosynchronous just like Geosynchronous Equatorial Orbital (GEO) node does in equatorial plane. HOWEVER, sub-orbital node's path now parallels Earth's equator about 1,000 km below the equatorial plane, Since this new circular path is smaller, non-equatorial and non-orbital (new path's plane misses Earth's center), TE chooses to call this new circular path a "sub-orbit". 2) Even better, TE Solution!!! Like a plasma weapon, TE proposes a Base Station which can point and fire a beam for a vessel to ride into the sky. Base Station can locate off the Equator and just fire the particle beam to the GEO Node on the zenith of an Equatorial point. Main consequence for choosing an off equator location will be a slightly longer flight path for the Beam Rider. EXAMPLE: If base station locates 8.7° south, the flight distance would increase from 35,780 km to 35,793 km, a minuscule amount. Out of 100's of challenges, we listed 14. OVERALL GOAL: Replace infeasible tether with much more realistic particle beam.